UK supermarket chain Tesco is fighting off online bigotry after including Muslim families in its pre-Christmas advertising. Some customers have threatened to boycott Tesco because of advertising scenes showing a Muslim family exchanging gifts. Others say the Muslims’ inclusion is “very wrong”. Those who support the “Everyone’s Welcome” ad are using social media to explain why it’s “wonderful to share the day with everyone,” regardless of their faith. One supporter of the adverts says his family celebrates Christmas each year with their Muslim friends. We give our Muslim neighbours’ kids Christmas presents, and they give presents to ours. We share food. A person against the ad’s said: ”I object strongly to your anti-Christian Xmas advert – how dare you politicise our festival in order to appease lefty political correctness. Tesco is defending its position, saying the advertisement aims to promote diversity. 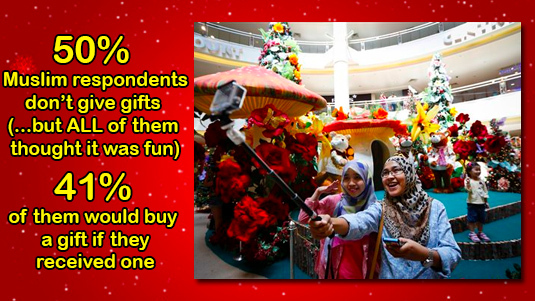 Many Muslims joined the online flurry explaining why they enjoy the festive season. One woman wrote: “I am Muslim and I love Christmas.